Actually I think this episode illustrates beautifully the difference between the scientists and the “auditors”. The auditors are crowing over a victory and suggesting that the changes will favor their position. The scientists just want to know the new result. The described methodology was passed by review but it’s now been discovered it wasn’t followed so the paper has been withdrawn. The obvious response now is to redo the analysis with the original methodology correctly applied to the same data and publish whatever the result is. Of course “unprecedented warming” wasn’t being sought so it doesn’t matter whether it is there or not. Even without climate change a historical temperature reconstruction of this sort provides a useful addition to our scientific knowledge. The only possible hiccup is if insufficient correlating proxies can be found in which case the paper should be shelved and a retraction of the reported claims tendered (this paper made news headlines). The way forward is not to fret about having made mistakes or worry about giving ‘different sides’ ammunition, but to see what actually changes and what it implies for anyone’s understanding of the real world. @Armand MacMurray, thanks for that info. I haven’t followed this issue closely. As Roger pointed out, Climate Audit is full of innuendo, and that’s just not my cup of tea when it comes to science. I tried reading through McIntyre’s posting, but even while admitting that this may not impact the results much he puts words like get in quotes and phrases as, “They might still claim to “get” a Stick using the reduced population of proxies that pass their professed test.” Using that kind of language isn’t exactly a gracious way to accept thanks, privately or publicly. I’m still not sure it was a public thanks. In my line-of-work I’ve recently seen some individuals publishing on their website the details of a private correspondence from a colleague from another institution, and that is just scummy. So that kind of thing just leaves a bad taste in my mouth. I’d consider it a public thanks if it was made public by the author, not but the recipient. This way is a private thanks, a classy way to handle a public thanks is simply to link to it. To Ray’s point, I agree. Give credit where credit is due. I just don’t know the full details and I find McIntyre’s innuendo off-putting. I’ll definitely give credit to the journal and the authors for being good scientists, acknowledging the problems in their own work, and moving forward to address them. You say “Actually I think this episode illustrates beautifully the difference between the scientists and the “auditors”. The auditors are crowing over a victory and suggesting that the changes will favor their position. The scientists just want to know the new result”. Ray, you could equally well have said “Actually I think this episode illustrates beautifully the difference between scientists A and scientists B. Scientists B are crowing [shame on them] over a victory and suggesting that the changes will favor their position. Scientists A just want to know the new result” (their enthusiasm unabated). Simon@55…except scientists publish. Auditors don’t. McIntyre has been “auditing” climate-science for something like a decade now. And it looks like this will be the first time that he has actually unearthed significant errors in a published paper. Science will never be error-free, but the fact that it has taken McIntyre (someone who is obsessed with uncovering scientific malfeasance/wrongdoing and who has had nearly unlimited spare time to pursue his obsession) on the order of a decade to find nontrivial errors in a paper really is a testament to the robustness of climate-science as a whole. 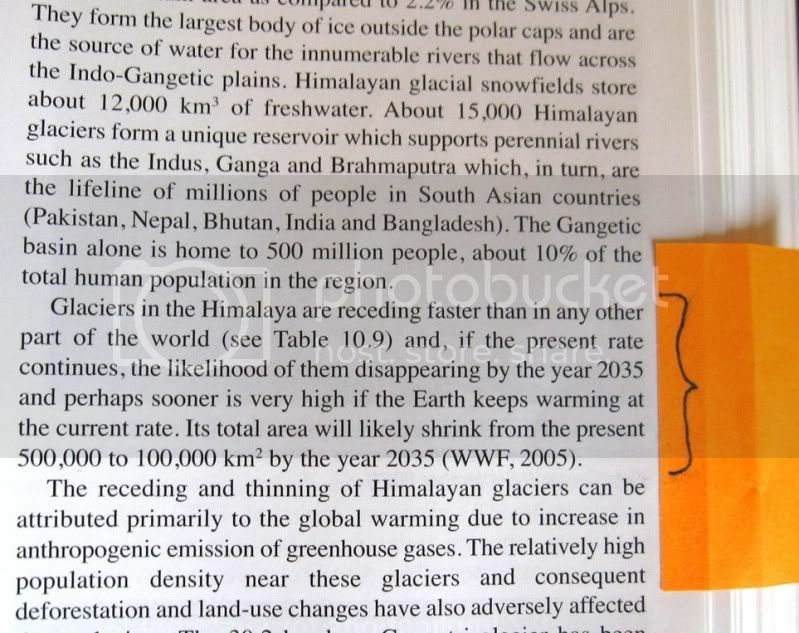 This whole thing seems reminiscent of the IPCC Himalayan glacier brouhaha. A real error uncovered, and an embarrassing one at that — but nonetheless an isolated one that did not have any impact on the science as a whole. And has McIntyre ever acknowledged that he erred when he used tree-ring data to train his “hockey-stick” red-noise noise generator without de-trending the tree-ring data first (to remove the long-term climate signal)? Because he failed to de-trend the tree-ring data before using it as a noise model, the “random noise” that he claimed would produce “hockey sticks” was itself contaminated with “hockey stick” signal statistics. That was definitely a major screwup/oversight on his part. It seems to me that when it comes to acknowledging errors, there’s more than a bit of a double-standard here. You could say it. You could say anything you want rhetorically and pretend it’s meaningful. You could say that when I fly a kite that I’m just like a commercial airline pilot. So you’re making innuendo about supposed innuendo about Climate Audit’s innuendo? Is this supposed to be clever? 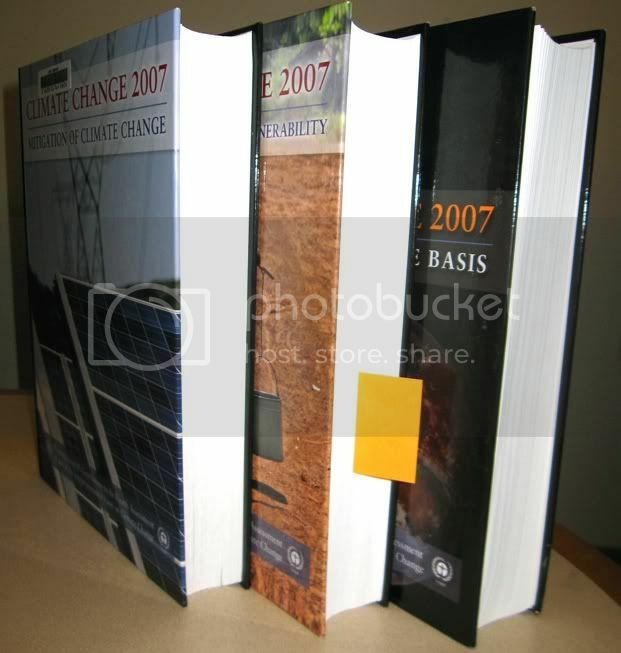 A while back, out of curiousity I looked up the *physical* IPCC AR4, that is the books themselves, in a library. Took a few photos of exactly what glaciergate amounts to. Feel free to link these if they’re useful. Here are the AR4 Working Groups I, II and III reports, close to 3,000 pages. 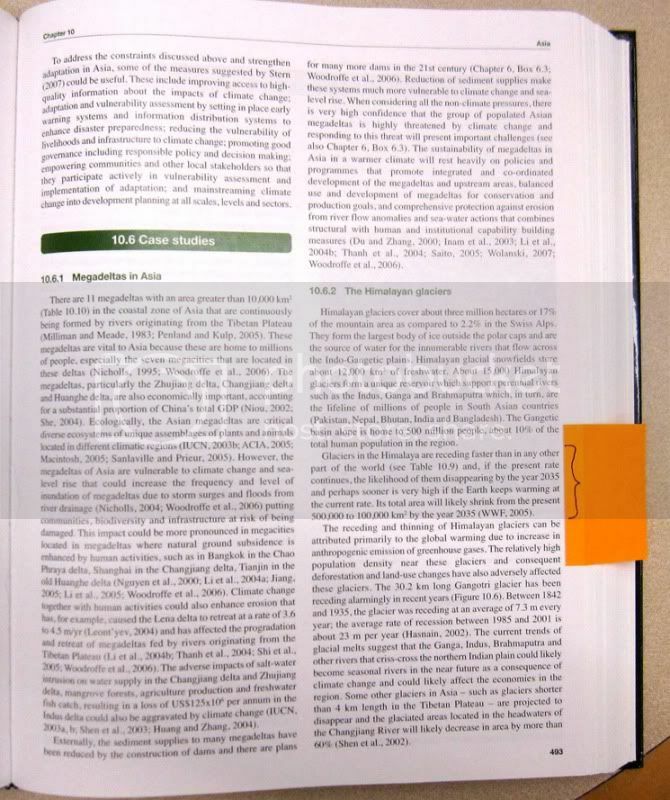 The orange tab marks the page containing glaciergate. Here is glaciergate itself, which happens on page 493 of the Working Group II (impacts) report. The orange tab marks the paragraph containing glaciergate. Here’s a closer look at glaciergate . It consists of two sentences out of that one paragraph. These are the two sentences, grammatically incoherent, mutually contradictory, and obviously written or copied carelessly while looking at something else. There you have it, the scandal. What defines science is its ability to make correct predictions: eclipses, Trinity, Apollo, for example. (That something happens to be published doesn’t necessarily confer scientific credibility, far from it). For those who study climate to arrogate to themselves the title “climate scientist” is in my view sadly hubristic and premature. Radiative physics is one thing but understanding the actual behaviour of clouds quite another. For me a field of study needs observable and verifiable results to qualify as science. In climatology there just aren’t any. Not any. Sorry Ray, until the climate community can make some convincing predictions about climate development and evolution they’re just wannabe climate scientists. Maybe one day, but not nearly yet. Considering that the Gergis et al paper has been “put on hold,” would it not be proper to indicate the same under the chart prominently displayed at the beginning of this section, or remove the chart in its entirety? Regardless of ones views/opinions on the overall subject global warming, this episode does highlight one aspect that frustrates sceptics. They make the charge, speaking in the generality here, that the MSM blindly and unquestioningly report stories, with lots of coverage, where a summary might fall under the headings ” it’s worse than we thought”, “it’s worse than it’s ever been”, etc. – and that this is the nature of the MSM. Their frustration is inflated then because no matter what happens afterwards, those headlines stick and any rereporting as a result of other evidence, retractions, etc – never get the same degree of coverage. Ah, I see James and Ian have received their talking points. What horsecrap! Dudes, do you think the level of emphasis for the scientific position versus the “skeptic” position even remotely approaches the 97% level of the actual scientific consensus? I do not know of a single other scientific topic where the level of consensus and its portrayal in the media are so divergent. Ray, I think you’re confusing signal and noise wrt the media coverage. Note how the instant a comment was made on this thread about one study being reconsidered out of 3 under discussion, the thread swerved into political perceptions of climate science/scientists – ignoring the “signal” represented by the other 2 studies and further ones cited in the topic post. We’ve now over 50% of the comments being irrelevant to the topic at hand. It comes as a shock, doesn’t it, the first time you realize it? Life is full of little surprises. That’s one of them. Each person discovers it, eventually. those who argue that uncertainty is a justification for inaction are precisely backwards in their thinking. Regardless of the state of this paper, anthropogenic climate change and global warming are both real. What your post highlights is the misconception in the general public that any new paper could change that. The scientific consensus isn’t swayed by the latest & greatest paper to be published. The consensus is built by taking the totality of evidence into account. When multiple independent avenues of investigation over the course of many years and decades point towards the same conclusion, it becomes the consensus understanding. Whether or not ACC or GW exist is not the interesting scientific question. We are now refining our knowledge of how they work. Any paper showing ACC or GW to not exist, no matter how well done, would need to be backed up by a plethora of papers to follow it, using multiple angles of viewing the world, before it would change the consensus. Ray:Ah, I see James and Ian have received their talking points. Yes. Trundle over to WUWT and you can read Ian and James’ lessons as delivered by the charismatic authority figure in charge. A bobble like Gergis’ is an opportunity to gauge the desperate hunger for real meat on the part of contrarians. They don’t require much substance to stay alive but when the rare treat is offered they become embarrassingly excited. In any case it’s going to be interesting to see the Gergis rework. Didn’t word my post as well as I should have — the “detrending” I was referring to (not the best terminology) was in reference McIntyre’s failure to remove the long-term (long autocorrelation time) climate signal from the tree ring data before he ran it through the hosking.sim() R procedure to generate his red noise. So it appears that McIntyre’s “trendless red noise” was contaminated by long-term “hockey stick” climate signal because of his failure to pre-process the tree-ring data properly before using that tree-ring data as a red-noise “template”. To my non-expert eyes, this seems like a pretty major oversight on McIntyre’s part — If I’m not totally off-base here, this seems like something that he should acknowledge, especially given the fact that he used his results to imply that Dr. Mann was so inept that he would confuse a random noise artifact with a coherent climate signal. Further to Hank’s pointer, Lewandowsky’s Uncertainty is not your Friend and The Inescapable Implication of Uncertainty are well worth taking in. Re Ian @ 70. You are correct. No one involved in then climate change debate will change their mind on the basis of one paper. But fundamental to the case that current climate change is a major concern is evidence that current temperatures are exceptional both in absolute level and rate of rise. The Gergis et al paper is an important addition to that case. ‘IF’ the Gergis et al paper is eventually rejected, the case that current temperatures are exceptional GLOBALLY is severely weakened. It would also indicate that the current peer-review process is inadequate. re Accuweather, it might be worthwhile to note that Brett Anderson (no relation) who has run their climate change blog forever is excellent (dare I say superb?) and does not burk the facts. In addition, it appears that over time there are others over there who are acknowledging reality. Yes, I know they have Bastardi and doubtless others, but it has changed for the better significantly IMO. Bastardi left Accuweather over a year ago. But fundamental to the case that current climate change is a major concern is evidence that current temperatures are exceptional both in absolute level and rate of rise. Restated, as the physics of this situation is quite clear at a nearly intuitive level and extending through outlandishly bulky calculations, it’s essential to contrarians to have alternative means of somehow discounting what’s painfully obvious. A myriad of jackalope hypotheses depend on maintaining the illusion of ignorance of the temperature record as well as being able to dismiss startling observations. One more reason that Jim didn’t mention for expecting the Gergis et al. result not to change much, is a couple of simple reality checks that can be done by inspecting the actual manuscript. See figure S2.2 page 56. Whether you use 27 proxies for the reconstruction, or 14, the resulting curves over the common period are highly similar. They tell the same story, in spite of only half of the proxies in one also being present in the other. Even using only four proxies doesn’t really change the storyline. To me this suggests that the story must be true. And if such large differences in the choice of proxies used produce such minor changes in outcome, why would changes in screening strategy be any more consequential? This stuff is way more robust than most people imagine. Or look at figure 2 page 47. Here, the reconstruction reproduces every single twist and turn in the instrumental data — not photorealistically, but well enough. Sure, the reconstruction was calibrated against the instrumental record — but, every gory detail? That only makes sense if those proxies really follow temperature. Remember that the recon is just a weighted sum of contributing proxies; calibration determines the weights. The only way the recon can follow the bumps in the instrumental record is if some or all of those proxies already do. So, this reconstruction may have its problems and may well not be the best that can be extracted from this data, but warts and all it is definitely a valid one. Thanks for the correction. Joe Bastardi’s departure does not change the substance of the rest of what I said. AccuWeather has been gradually altering, and Brett Anderson has never been anything but solid on the facts. I still believe they are moving towards a more reality-based position on climate change and global warming, in line with developments in the world. “we did it”, no matter how you look at it, we did it, that’s it..
77 Robert , nice to know that someone there has some understanding of AGW, it would be infinitely better if they actually refuted those who claimed that trace gases are of no significance. In here lies the difference, and especially the great confusion, contrarians love and live by this confusion, if on one hand one representative says something and the other completely the opposite, how can they represent the same science? How is the lay audience suppose to judge all this? Especially since one view clashes violently against the other. Freedom to speak is great, it reveals the point of view behind the person, but the institution practicing meteorology is equally free to speak, I haven’t heard Accuweather refuting Bastardi while he confidently broadcasted to millions that a trace gas is of no import. I am waiting for this meteorological company to defend correct science in order to clear the air. Without this, the good work of Mr Anderson is much diluted with junk science having no prediction prowess. This stuff is way more robust than most people imagine. Now, this doesn’t have anything to do with the Gerges et al. data, but it’s still a nice example what kind of results you can get from a totally $#@!ing robust data-set. Some time ago, I tried generating global-average temperature estimates from very small numbers of GHCN stations (using *raw* data). Divided up the planet into just 4 grid-cells, picked a single *rural* station per grid cell (i.e the station with the longest temperature record in that grid cell), and computed average temperature anomaly results from just those 4 *rural* stations via a brain-dead-simple anomaly-averaging procedure. Repeated the process several more times by successively increasing the number of grid-cells (whilst keeping the grid-cell areas as close to constant as possible) and selecting 1 *rural* station per grid-cell as described above. That would be *raw* data from exclusively *rural* stations, lurkers — so issues involving UHI or data “homogenization” have been taken off the table here. As you can see, data from only a few temperature stations is needed to see a clear global-warming signal. And by the time you get to ~70 (out of thousands) of stations, you get results that track the official NASA/GHCN results pretty darned closely. The take-home lesson for new lurkers here is: A brain-dead-simple averaging procedure, applied to raw data collected from a very tiny percentage of the GHCN stations, still produces global-average temp results that match the official NASA/GISS results *very* closely. The take-home lesson for lurkers here is: In spite of what Anthony Watts and other deniers have been telling you for gawd-knows how many years, the surface temperature record is way more robust than most people imagine. What writers of and posters to, Real Climate do not acknowledge is that the MSM seizes on papers such as that of Gergis et al to promulgate the position of the proponents of anthropogenic climate change/global warming but do not run subsequent stories announcing that the results may not be entirely as initially presented. Consequently although scientists and possibly even auditors, may be aware that there could be a modification of the results, this is not made clear to the general public and could generate a bias in public opinion. The reason the paper was so important was because it purported to show an “Australian hockey stick”. They started with 62 proxies, discarded 35 leaving 27 and have a whopping 2 proxies going back 1000 years and 0 of them actually from Australia. They made a big deal about screening de-trended data to eliminate the obvious statistical problems of pre-screening for your desired signal. Now it seems likely they will remove that statement and screen the paleo-climate way instead, (well this proxy matches our signal, so we are going to use it to independently confirm our signal, this one doesn’t match our signal, so we’re not going to use it to disprove our signal). The paper originally showed it was less than one tenth of a degree C warmer today than 1000 years ago with an uncertainty of 2 tenths of a degree (nice). It’s not going to be a ‘stronger more robust’ paper when it’s re-submitted without the de-trending statement. The uncertainty will increase. So, to be all Perry Mason about it, you stipulate that if the paper is corrected and the results do not change, you will continue to find it important? That is to say, your belief about the importance of the recent change in temperature will be swayed? Re: Jim (response to Martin – 85). What everyone can reliably predict, on both sides of the debate, is that the paper will be re-submitted relatively unchanged, but with reference to ‘screening de-trended data’ removed from the description of the methodology. Your own comments, here and in another place, have indicated this would be acceptable to your side of the debate. Amazing how quickly these discussions swerve out of any rational basis. There’s a wealth of information in D. Robinson and oakwood’s remarks but it mostly doesn’t pertain to Gergis et al. “Had they done this in the first place, if it had later come to my attention, I would have objected that they were committing a screening fallacy (as I had originally done), but no one on the Team or in the community would have cared. Nor would IPCC. I’ll hazard a guess that McIntyre’s expecting the conclusions of the paper to remain unchanged. Whether his remarks are inoculation against disappointment or sincere belief remains even more speculative. BTW, McIntyre’s use of words such as “forgery” is exactly why his followers shouldn’t be surprised when other people find his language distracting and counterproductive. If you’ve not already soaked in that style of debased hyperbole it’s quite conspicuous. Good grief, all you have to do is just print the words “hockey stick” and the crazies come out in force. Jim, simply give us here a succinct and brief statement on how you would handle the issue. Your statements have been unclear. I recall you seemingly to agree with the Gergis screening process and seemed to insist on the detrended procedure. Later you referred to either selection process – detrended or not detrended – could be used. Notice that there’s a distinction drawn between the later and earlier portion of the record? One of the striking things about McIntyre’s critique is how he’s able to invert Gergis’ meticulous approach to data quality and recast it as nefarious. On the other hand, if you prefer more proxies, drape the entire Gergis record on the ensemble of other similar reconstructions and watch it vanish; the Gergis result is hardly a surprise and fussing over the number of early proxies in the reconstruction isn’t going to make things pleasingly unbent. More proxies whether they come in ones or twos or by the dozen only help cement what’s fairly obvious at this point. As usual, the lesson here is to actually look at the paper in question– look at everything– not just follow instructions. #90 Jim, a post laying out the real issues would be a useful antidote, but I can understand you might have better things to do. It seems to me that Gergis et al have at least three choices. a) They could stick with the screening methodology exactly as described. But this would apparently result in only 8 proxies in the reconstruction, as far as I can tell. b) They could adjust the methodology to what was actually done (i.e. not detrend proxies and temp series before screening). This seems to be what McIntyre expects. But I would be surprised if this were done without at least exploring other approaches, given that this was a key, explicitly justified, element of the original methodology. c) They could relax some of the other screening criteria, but still apply to detrended series. Here Mann et al 2008 gives some possible changes. Presumably using p &lt 0.1 and one-sided significance screening (eminently justified, IMHO) would result in a proxy set somewhere between 8 and 28 in size (although at least one tree-ring and one coral proxy would get tossed). Or they could do all of the above (or other variations) and compare the robustness of the resulting reconstructions. Re: Jim (87) and dbostrom (88). Let’s just see what happens. I will be pleased if my prediction is wrong. The Internet, it’s a series of tubes. Most of them transfer copypaste — from one location to another. Oakwood: I will be pleased if my prediction is wrong. As we’ve been requested to be attentive attribution and due credit by the CA folks, just for the record Oakwood is repeating Steve M.’s prediction. For predictor selection, both proxy climate and instrumental data were linearly detrended over the 1921–1990 period to avoid inflating the correlation coefficient due to the presence of the global warming signal present in the observed temperature record. While the paper states that “both proxy climate and instrumental data were linearly detrended over the 1921–1990 period”, we discovered on Tuesday 5 June that the records used in the final analysis were not detrended for proxy selection, making this statement incorrect. Although this is an unfortunate data processing issue, it is likely to have implications for the results reported in the study. The journal has been contacted and the publication of the study has been put on hold. “Likely to have implications for the results” suggests the authors are at least considering alternatives to simply specifying screening with non-detrended data. I’ve long wished he were still around to comment on temperature reconstructions. Maybe if we borrow the medium Fred Singer must of used to connect with Seitz for 2 years. re: gavin comments in #75 on peer review and luck, for such as Soon and Baliunas. Dana1981 did a nice synopsis at SkS on Pal review. Luck is nice. The right editor is much better. D. Robinson, we know from the instrumental record that temperatures have trended upward over Australasia as they have globally. This — what you call “the signal” — we do not need proxies for to tell us, we knew that already. The interesting thing is what happens further back, where we don’t have instrumental data. But tell me, would you actually trust as temperature proxies, proxies that fail to repond to this clear signal? “you are guilty of believeing in, and executing, the “Screening Fallacy”, which they suppose, with nebulous definition and no actual demonstration of validity, is some kind of inviolate law”. The law of course being, no hockey sticks.